Off-Pitch Focus: What can Euro 2016 teach us about Brexit? The tournament would look very different without migration, says Ciarán Breen. On Thursday, June 23, as Euro 2016 took its first breath on a day with no games, the United Kingdom voted via referendum to leave the European Union. Sending shockwaves across the continent and beyond, the unexpected ‘leave’ vote had an immediate impact on financial markets, resulted in the resignation of the British Prime Minister, and caused a lot of confusion and concern amongst British citizens. In the aftermath, sports writers pondered the effect the political disengagement might have on the Premier League next season and in those seasons to come. After all, there are many players plying their trade across the British Isles who would not meet the visa requirements for international players if they weren’t covered by freedom of movement and labour laws within the European Union. This speculation, while newsworthy, is a little premature, because until the details and timelines of the UK’s exit from the union are confirmed, there will be no immediate change on the ground for football. What is timely, however, is a reflection on what a European Championship would look like without the very migration that the ‘leave’ campaign is striving to limit and prevent. Monday, June 20 was World Refugee Day. 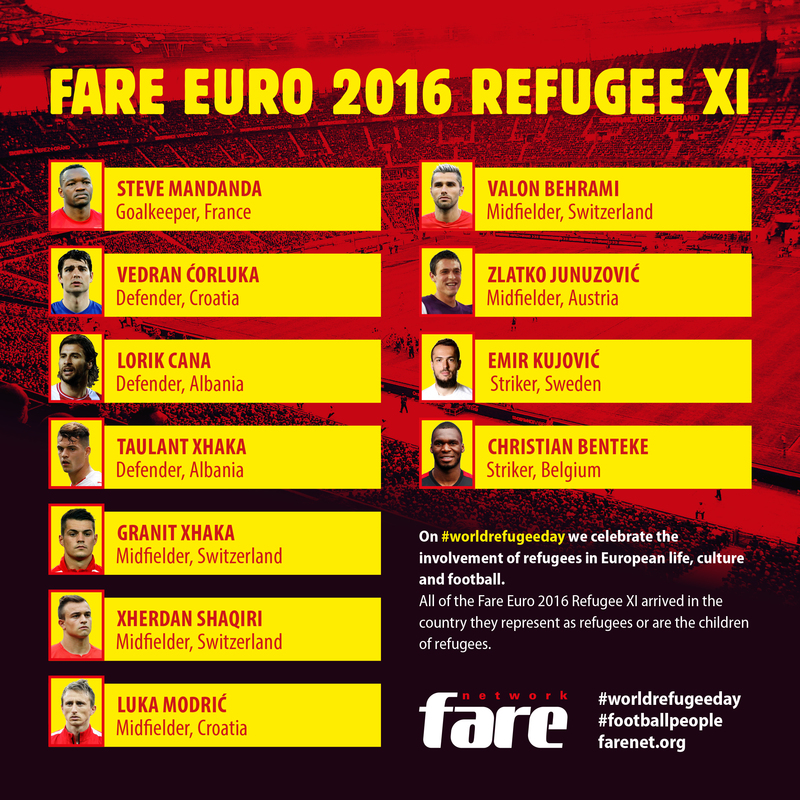 To mark the date, the FARE Network named a Euro 2016 Refugee XI, featuring Luka Modric, Xherdan Shaqiri, and Christian Benteke amongst others. The FARE Network is an umbrella organization of fan groups, NGOs, amateur clubs, and grassroots groups, all committed to fighting discrimination and exclusion in football. So as the quarter-finals kick off today, a quick look behind the patriotism will find many complex stories of migration, settlement, and ultimately success for some of Europe’s top football stars. Almost half of the Belgian and French squads are of African descent, and many players on the Portuguese and German squads were born to parents from elsewhere than the nation they represent. Even the impressive Italy team is getting in on the act. Despite former coach Arrigo Sacchi’s comments about too many black players in Italian youth teams, claiming, “We are losing our national pride and identity”, Angelo Ogbonna, Stephan El Shaarawy, and Éder have broken the mold of a traditionally homogenous team. The United Kingdom may be on a path to tighter border controls in a vain attempt to avoid addressing systemic issues of economic downturn, employment, and inequality. If the Euros teach us anything about Brexit, it’s that in diversity, we have strength; in football, we have hope; and in fear and loathing, we have a less colourful continental championship. Let’s hope in four years’ time, when Euro 2020 is held in thirteen cities in thirteen different European countries, the imagined community remains real.